The temple is near the town of Katra, in Udhampur district in the state of Jammu and Kashmir,. It is one of the most revered places of worship in Northern India. The shrine is at an altitude of 5200 feet and a distance of approximately 12 kilometres (7.45 miles) from Katra. Million of pilgrims visit the temple every year and is the second most visited religious shrine in India, after Tirumala Venkateswara Temple. 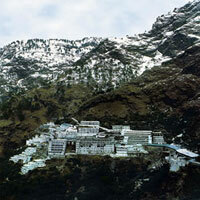 The Shri Mata Vaishno Devi Shrine Board maintains the shrine. A rail link from Udhampur to Katra is being built to facilitate pilgrimage. With the passage of time many more stories about the Mother Goddess emerged. One such story is about Shree-Dhar. Shree-Dhar was an ardent devotee of Ma Vaishno Devi. He resided in a village called Hansali, 2 km away from the present Katra town. Once Ma appeared to him in the form of a young bewitching girl. The young girl asked the humble Pandit to hold a ‘Bhandara’. (A feast to feed the mendicants and devotees) The Pandit set out to invite people from the village and near-by places. He also invited ‘Bhairav Nath’ a selfish demon. Bhairav Nath asked Shri-Dhar how he was planning to fulfill the requirements. He reminded him of the bad consequences in case of failure. As Panditji was lost in worry, the Divine girl appeared and told Him not to be despondent as everything had been arranged. She asked that over 360 devotees be seated in the small hut. True to Her word the Bhandara went smoothly with food and place to spare. Bhairav Nath admitted that the girl had supernatural powers and decided to test Her further. He followed the Divine girl to Trikuta Hills. For 9 months Bhairav Nath was searching for the mystic girl in the mountains, whom he believed was an incarnation of the Mother Goddess. While running away from Bhairav, Devi shot an arrow into the Earth from which water gushed out. The resultant river is known as Baanganga. It is believed that by taking a bath in Baanganga (Baan: Arrow), a believer of the Mother Goddess can wash away all his sins. The banks of the river, known as Charan Paduka, are marked by Devi’s foot imprints, which remains intact till date. Vaishno Devi then took shelter in a cave known as Garbh Joon near Adhkawari where she meditated for 9 months attaining spiritual wisdom and powers. Her meditation was cut short when Bhairav located her. Vaishno Devi was then compelled to take the form of Maha Kali when Bhairav tried to kill her. The manifestation of the Mother Goddess took place at the mouth of the Holy cave at Darbar. The Goddess then beheaded Bhairav with such sheer force, that his skull fell at a place known as Bhairav Ghati, 2.5 km from the Holy Cave. Besides going by foot you can also go by Helicopter from katra to the shrine and back. On request we can arrange the holy trip as desired by you. One of the holy trinity, Shiva is a living god. The most sacred and most ancient book of India, the Rig Veda evokes his presence in its hymns. Vedic myths, ritual and even astronomy testify to his existence from the dawn of time. But Shiva, the destroyer, the mendicant, is undefinable: he is the great yogi, the guardian of the absolute. His actions are the themes of the myths in which his nature unfolds. Legend has it that Shiva recounted to Parvati the secret of creation in a cave in Amarnath. Unknown to them, a pair of mating doves eavesdropped on this conversation and having learned the secret, are reborn again and again, and have made the cave their eternal abode. Many pilgrims report seeing the doves-pair when they trek the arduous route to pay obeisance before the ice-lingam (the phallic symbol of Shiva). The trek to Amarnath, in the month of Shravan (July-August) has the devout flock to this incredible shrine, where the image of Shiva, in the form of a lingam, is formed naturally of an ice-stalagmite, and which waxes and wanes with the moon. By its side are, fascinatingly, two more ice-lingams, that of Parvati, and of their son, Ganesha. According to an ancient tale, there was once a Muslim shepherd named Buta Malik who was given a sack of coal by a sadhu. Upon reaching home he discovered that the sack, in fact, contained gold. 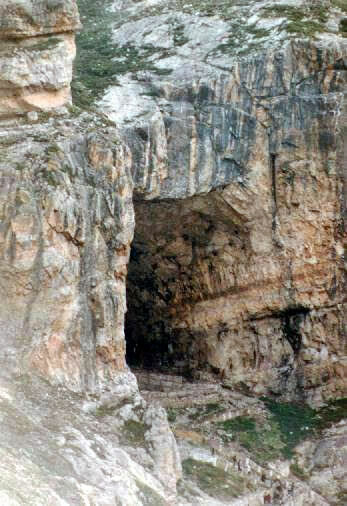 Overjoyed and overcome, Buta Malik rushed back to look for the sadhu and thank him, but on the spot of their meeting discovered a cave, and eventually this became a place of pilgrimage for all believers. To date, a percentage of the donations made by pilgrims are given to the descendants of Malik. and the remaining to the trust which manages the shrine. Yet another legend has it that when Kashyap Reshi drained the Kashmir valley of water (it was believed to have been a vast lake), the cave and the lingam were discovered by Bregish Reshi who was travelling the Himalayas. When people heard of the lingam, Amarnath for them became Shiva’s abode and a center of pilgrimage. Whatever the legends and the history of Amarnath’s discovery, it is today an extremely crucial centre of pilgrimage, and though the route is as difficult to trespass as it is exciting, every annum, millions of devotees from the subcontinent come to pay homage before Shiva in one of his Himalayan abodes. Situated in a narrow gorge at the farther end of Lidder valley, Amarnath stands at 3,888 m and is 44.8 km from Pahalgam and 141 km from Srinagar. Though the original pilgrimage subscribes that the yatra be undertaken from Srinagar, the more common practise is to begin journey at Pahalgam, and cover the distance to Amarnath and back in five days. Pahalgam is 96 km from Srinagar. The trek from Pahalgam to Amarnath cave is on an ancient peregrine route. 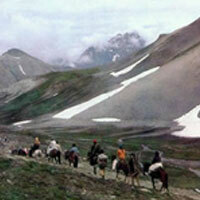 The 45-km distance is covered in four days, with night halts at Chandanwari, Sheshnag (Wawjan) and Panchtarni. The distance from Pahalgam to Chandanwari (12.8 km) is covered in about five to six hours, and the trail runs alung the Lidder river. Pilgrims camp here on the first night out. A major attraction here is a bridge covered, year round, with ice even though the surroundings are free from it. The next day’s trek, of 13 km, is through spectacular, primeval countryside, and the main centre of attraction is Sheshnag, a mountain which derives its name from its seven peaks, resembling the heads of a mythical snake. The journey to Sheshnag follows steep inclines up the right bank of a cascading stream and wild scenery untouched by civilization. The second night’s camp at Wawjan overlooks the deep blue waters of Sheshnag lake, and glaciers beyond it. There are legends of love and revenge too associated with Sheshnag, and at the camp these are recounted by campfires, to the stillness of a pine-scented, Himalayan night. The third day’s 13 km trek steadily gains height, winding up across Mahagunas Pass at 4,600 m and then descending to the meadow-lands of Panchtarni, the last camp enroute to the holy cave. From Panchtarni to Amarnath is only 6 km, but an early morning’s start is recommended for there is a long queue awaiting entrance to the cave. The same day, following darshan, devotees can return to Panchtarni in time for lunch, and continue to Wawjan to spend the fourth night out; or continue further to Zojibal, returning to Pahalgam on the fifth day. Entrance to the cave is regulated, and darshan a hasty affair for there are many others waiting outside to pay homage before the awesome Shivalinga. The devotees sing bhajans, chant incantations, and priests petform aarti and puja, invoking the blessings of Shiva, the divine, the pure, the absolute. For those who journey with faith, it is a rewarding experience, this simple visitation to a cave-shrine, the home of the Himalayan mendicant who is both destroyer and healer, the greatest of the Hindu deities. Besides going by foot/camp you can also go by Helicopter from Srinagar to the cave and back or from baltal to cave and back.